Remember that when Iran polls reflect what Western media wants, they're considered legit, but when they don't, they're dismissed as skewed. 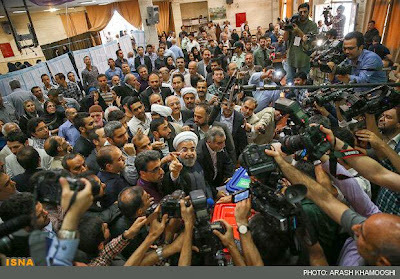 Western media busy getting narrative straight: If Jalili, vote was rigged. If Ghalibaf, vote was rigged. If Rouhani, president has no power. Remember, people can write of "widespread use of election fraud in 2009" without citing a shred of credible evidence, cuz, y'know, Eye-ran. Reading Western media on tomorrow's election is proof that, regardless of who wins, propagandistic coverage of Iran will not change at all. Remember, in Iran only vetted, establishment candidates can become president. Unlike in US, where write-in votes invariably win the day! Can the United States Supreme Court just decide who won the Iranian Presidential Election already, so we can all move on? Remember, when people thought Rohani couldn't win, it was bc "they" wouldn't let him. Now that he has a chance, it's bc "they" want him. For 8 years Ahmadinejad was called a genocidal dictator w/ his finger on a button. If Rohani wins, we'll hear the president wields no power. If Rohani win is official, the thing we'll hear most often tmrw in mainstream press is how Iranian President has no control of nuclear prog. Rohani seems to be wiping the other presidential candidates off the electoral map. If, as some are saying, Rohani is Obama to Ahmadinejad's Bush, then Pakistani & Yemeni civilians better watch out for more flying deathbots. I can't wait to hear about how similar to Hitler Rohani really is. I'm sure FDD, AIPAC and Dershowitz are planning a conference call. Remember, the Islamic Republic has no legitimacy w/in Iran which is why voter turnout is 75% & an establishment cleric is elected president. Finally, a cleric in a position of power in Iran. Can't wait for whatever backhanded, smug statement the White House issues on the Iranian election and then for the new AIPAC-led sanctions. Remember, Iranians were given no choice & have no agency in government whatsoever, which is why they're singing & dancing in the streets. Remember, experts said sanctions are working which is why Khamenei would rig election for Jalili. Now, sanctions are working bc Rohani won. In order to really know what's going on inside Iran, let's hear from Tel Aviv-based experts who knew for sure Rohani wouldn't win. Remember, with the snap of his fingers, Iranian president can carry out 2nd Holocaust. Wait, what? Oh, I mean, the president has no power. It's such a relief that the result of the Iranian presidential election has somehow reaffirmed literally everyone's own narrative. Oh, don't worry. The result of the Iranian election will in no way encourage any semblance of future humility in our Iran expert community. Remember, presidents wield no substantive power in belligerent, Big Brother states, which is why Guantánamo is still open.